Ian Collis is Head of Stats at Fox Sports, a leading historian on sporting history and, naturally, statistics as well as being an avid collector of sporting memorabilia and photographs. Like his RETRO CRICKET book, his love and authority comes through in this latest book of his although the book is much smaller in shape. However, as Mad Dogs and Englishmen going into the midday sun is, again naturally, a very English phrase so, for Ian’s book, is the equally apt good things come in small packages. Written by an Australian – with, I am sure, no slight intended for us Englishmen who venture out to play sport when it’s hot: after all, the Australian climate can be far more formidable! – there is a lot initially about Tests between the two countries. Remember, though, that that is how Test cricket started and the third and fourth-playing nations, South Africa and West Indies, also appear in due course. 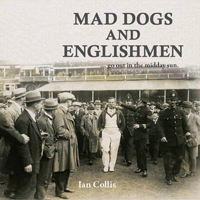 What is wonderful about Mad Dogs and Englishmen is that many of us will recognise cricket photographs in many publications but, with this one, the vast majority have every chance of being new to many readers. Granted, it is a pictorial history but it is a very impressive history of the great game and its collection of black and white and sepia photographs naturally brings back this evocative age. It is beautifully presented too. Photographs depict the changes through the ages, for instance, the cover photograph showing the perhaps eccentric English captain, pipe-smoking Lionel Tennyson, walking on to the ground with flat-cap and bowler-hatted crowd members alongside and a police presence. Unthinkable today. The book includes players on and off the field, crowd presence again features predominantly and some of the posters of the day appear as well as much more. The Duke of Edinburgh features as does Don Bradman’s famous last Test dismissal: not the famous photograph seconds after the said dismissal but one taken from the side. Ian Collis must once again be congratulated on producing, in this case, a mini gem alongside, a few months ago, a magnum opus, Retro Cricket. I must also thank my colleague for reluctantly parting with it to allow me to write this review. We both thoroughly enjoyed it and trust that there will be more such books from Ian Collis and New Holland Publishers.